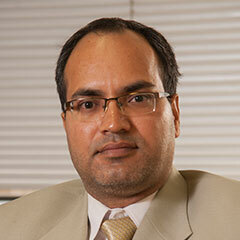 Since 2012, Dr. Syed has been a Research Scientist III at Center for Integrative Petroleum Research (CPIR). Between 2009 – 2010, he was a postdoctoral researcher in Dr. Victor Snieckus group, Chemistry Department, Queen’s University. He has also been involved in several national-funded and client-funded research projects. He has an established track record of publishing high-quality articles in prestigious journals. His areas of interest include the synthesis and purification of surfactants, polymers, chelating agents and their use in various oilfield applications such as drilling mud, stimulation and enhanced oil recovery. Dr. Syed is also proficient in the use of air-sensitive and pyrophoric reagents. Ph.D., Synthetic Organic Chemistry in collaboration with Queen’s University and University of Karachi University, 2009. MS, Organic Chemistry, University of Karachi, 2002. “Amido-Amine-Based Cationic Gemini Surfactants: Thermal, Interfacial Properties and Interactions with Cationic Polyacrylamide“, M. S. Hussain, Muhammad Shahzad Kamal, Abdullah S. Sultan, Journal of Surfactant and Detergent, (Accepted 2016). “Development of Novel Amidosulfobetaine Surfactant-Polymer Systems for EOR Applications“, Muhammad Shahzad Kamal, S. M. S. Hussain, Abdullah S. Sultan, Journal of Surfactant and Detergent, Vol. 19 (2016), pp. 989-997. “Synthesis, crystal structures and catalytic activity of new palladium(II)-bis(oxazoline) complexes“, Mansur B. Ibrahim, Imran Malik, S. M. S. Hussain, AtifFazal, Mohammed Fettouhi, Bassam El Ali,Transition Metal Chemistry, Vol. 41 (2016), pp. 739-749. “Synthesis, Characterization and Surface Properties of Amidosulfobetaine Surfactants bearing odd-number hydrophobic tail”, M. S. Hussain, Mustapha AlaoAnimashaun, Muhammad Shahzad Kamal, NisarUllah, Ibnelwaleed A. Hussein, Abdullah S. Sultan, Journal of Surfactant and Detergent, Vol. 19 (2015), pp. 413-420. Higher Education Commission of Pakistan International Scholarship Award. GRE (Subjective, Chemistry by ETS, USA) 61 percentile. Junior Research Fellowship Award from H.E.J. Research Institute of Chemistry, University of Karachi.